this is amit k singh and am a trainee pilot with indira gandhi rastriya uran akademi fursatganj raebareli up.the provided information is quite informative.i have some query regarding vimana shastra,could i get original manuscript of vimana shastra of maharishi bhardwaj. I am a student and i will be starting my B.tech first year next year, If you are interested then please do let us work together and restore India’s glorious heritage from its ashes. Kindly Share some more facts about Indian knowledge. I will be very great full to you. yes brother excatly, of late Ive been searching our past and it just astonishes me, the things like metalurgy, ancient warfare, yoga and its various forms, time space cosmos etc., and the vast amount of knowledge that is stolen and appropriated by the west. and even in the last century lot of it had been appropriated and not given credit. what pains me and many is that not even a single achievement is taught in our history books and our history books still contain the colonial falsities which have thoroughly disproved. they are even pumping in more falsities. It stems the confidence in any child reading it. we as this generation of Indians need to change this immediately. this Bharathvarsh, the mother of all civilisations is truly the mother Goddess. hiii amit i am persuving my btech 3rd year aeronautical engineering i am also interested in this ancient work did u get that original book if u r interested sir the we can do that project combinely as in our college also that research work has been started on this project and we are working on it if you have any informayion then please let us know it will be very helpful to us sir ..
i was wondering can a tesla coil be used in anyway to power a vimana ? It might help some way, but need to find out yet. my self venkatakrishnan, lot of our ancient cultural and vedic concepts are very much advanced science and technicaly that might be the limit. kindly try to approach our vedic concepts with scientific baground instead of thinking it as an old concept. am a prohit and am done my msc psychology. 1. The diagrams made from the text was by T.K. Ellappa. These diagrams were added later on. The study by IIS may have found the diagrams incorrect which may merely mean that the translation from text to diagram made by T.K Ellappa was incorrect. 2. The text was originally in Sankrit and there may have been faults during translation to English. 3. Modern science is not yet mature enough to understand all of the techniques mentioned in the Vimanika Shastra. For example, the Shastra speaks of using solar energy and Liquid Metal (probably Mercury) which are now being used as energy sources propulsion fuels only recently. 100 years back, someone speaking about using mercury or sunlight as fuels would have been rubbished. Same way, the other techniques in the shastra are being rubbished by IIS today. But 20 years from now, these may get authenticated. I fear that when in the future, an actual plane or spacecraft is made with use of one of the Vimanika shastra propulsion techniques, the technique will bear the name from someone from the west and our Vimanika shastra will go into oblivion. Thanks for reading the comment!! Jai Hind! excatly brother. THis appropriation has happened many a times in past millenia. It should not be allowed to happen at least after the next decade. We Indians are taught such false history, which is literally of no value. It makes us feel inferior. This has to go and true history has to be taught. We should unite and make this hapen. Please excuse my typos in the comment posted above. Any one having bhardwaj viman shastra in hindi or Sanskrit. No Specific Information about from where it was founded, so that i can followup, Auther of this Blog pls help! The very first translational error in VS is that soma,shoundalika and mourthwika are infact mineral ores and not metals.Also Raajaloha is a modification of Iron that is very easy to manufacture.Several other alloys are also easy to decode.I wonder how people call it hoax.Even scientists at IISC failed to understand. THE VIMAN SHASTRA WAS SO ADVANCED IN ANCIENT TIMES THAT WE COULDN’T THINK OF THEM.I’M AIRCRAFT MAINTENANCE ENGINEER IN AIR INDIA AND SADHAK OF GURU SHISHYA PARAMPARA OF AVADHUT SAMPRADAYA FORMED BY SHREE PANT MAHARAJ BALEKUNDRI.THE KNOWLEDGE WAS KEPT SECRET BECAUSE ONLY PURIFIED SOUL CAN USE THAT FOR GOOD PURPOSES.ONLY GREAT SADHAK AND YOGI KNEW THAT SECRET IN ANCIENT TIME.MORE DETAILED STUDY IS EXPECTED FROM SCHOLARS OF ALL PART OF HINDUSTAN. Avadhut ji meine bharat ki purani science and technology par research kar raha hoon.sabse jyada rahasayamaya aur vivaspad vaimanika shastra hai. mein kafi kuch iske bare mein khoj raha hoon. aap ek AIRCRAFT MAINTENANCE ENGINEER hai aur iske bare mein kafi kuch batein khojne mein meri help kar sakte hai. to mei apse request karta hoon agar aap meri help karna chahte hai toh meri id hai monuwagish@gmail.com aap please contact karein. pandit g agar aaoki reaserch kuch kamyab hui ho to mere sath share kare .meri id hai -mittalhot83@gmail.com.dhanyawad. I also doing research on this if you have any information you can contact me. I would like an English or Hindi or Sanskrit version of the Vaimanik Shashtra. Any one know if it is print. I just read on Wikipedia the following. Is it really an early 20th century text? I thought it was very ancient. Can some please clarify. The Vaimānika Shāstra ( वैमानिक शास्त्र, lit. “shastra on the topic of Vimanas”; sometimes also rendered Vimanika, Vymanika) is an early 20th-century Sanskrit text on aeronautics obtained by psychic channeling and automatic writing. It makes the claim that the vimānas mentioned in ancient Sanskrit epics were advanced aerodynamic flying vehicles, similar to a rocket. The existence of the text was revealed in 1952 by G. R. Josyer who asserted that it was written by Pandit Subbaraya Shastry (1866–1940), who dictated it during the years 1918–1923. A Hindi translation was published in 1959, while the Sanskrit text with an English translation was published in 1973. It contains 3000 shlokas in 8 chapters which Shastry claimed was psychically delivered to him by the ancient Hindu sage Bharadvaja. The text has gained favor among proponents of ancient astronaut theories. We agree that the IISc had given such a report. The Recent results from multiple Research institutes including IISc proved that the previous conclusions from them were wrong. Infact in 2012, around Septemper – October, there was a conference held in Uttaradi Math, Bangalore, on Vaimanika Shastra, where professor a from IISc came with his students studying on Vaimanika Shastra, another person an retired Aeronautical Engineer, had his team explaining the Shakuna Vimana (Bird like Aricraft) and also brought a model that flew across. Quad-copter is infact the description of Rukma vimana, – Consider this being latest technology, but how were they explained in a book that was published first in 1950s and later with English translation in 1970s. Also, we would suggest to read the book Rediscovery of Vaimanika Shastra – A project study conducted by wg. Cdr. M.P.Rao, etc. of Aeronautical Society of India on behalf of Aerospace Information Panel of Aeronautics Research and Development Board, B-Wing, Sena Bhavan, New Delhi 110011, India. http://vaimanika.com/VymanikaShastraRediscovered/index.html – you need password for this, once downloaded from links provided on the page, please follow instructions as per the web page. Thanks for your response. I hope someone who is knowledgeable can take the initiative to change the contents in Wikipedia. It is important that Wikipedia reflect the truth. Westerners do tend to downplay India’s achievements. More apalling and depressing is the the fact that many indian scholars tend to put down India . However, my question is whether there is any other ancient text about Viman? I know there are references in Ramayan and sporadic references in other texts. 1) Is this a fact that there is no dedicated text or book on Vman other than the Vymanik Shastra. 2) what is the role of Rishi Bhardwaj as far as Vimans are concerned? 3) Is there any estimate on the time period when he lived? I am also trying to find information regarding the discovery of the city of Dwarka under the gulf of Cambay. Do scholars now agree that the underwater city is Dwarka? please share any information you have or please direct me to any resource you are aware of. i hope you dont mind my questions. Thanks for your time and Namaste. 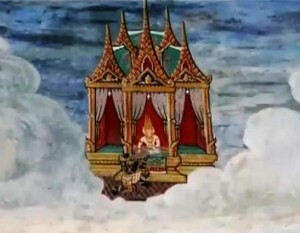 The vimanas listed in Ramayana is not related to the ones that are flying in this yuga. they are called mantra vimanas (which flew with mantra shakti), where as the ones in this yuga is called yantra vimana (ones that use engines). In fact, even in dwapara and satya(krit) yugas there are references of vimanas which are tantra and tapo/satya shakthi vimanas respectively. Getting back to books on vaimanika shastra, yes there are 2 references, both said to be by same Rishi, and have similar shlokas, one with the hindi translation is called brihad vimana shastra (the larger version) other is called vaimanika prakaranam or vaimanika shastra (with english translation published in Mysore). Amshubhodhini and other related books are available with as the references, however, there is no trace of DarpraNaprakarana, or yantrasarvasva or valmiki ganita available now, however, there are chances of these books available in countries western or eruopean countries. Another point here, We need to know that most of the knowledge in Bharatha varsha was not recorded in books they were thought in the form of shruthi hence, there might be unrecorded documents on this. Maharshi Bharadwaja is considered the one who learnt the shastra from Guru Dakshina murthy (Knowledge form of Lord Shiva) and authored the vaimanika shastra. There are scholars working on the estimation of the time period of the Maharshi Bharadwaja, however, the time with respect to British is not proper, the vaimanika shastra was authored in kali yuga, and it was between 1000BC to 500BC as per one of the estimations. We do not have proofs for this however, with respect to the way the text is rendered, it is considered older than what was initially judged. Getting to proofs of dwaraka, there yes, people do agree with the existance of dwaraka with proofs of photographs that were taken in the first mission, there are documentaries that are published on that, you can look for them, additionally, the Story of India bbc Michael wood is a good reference for this. S. R. Rao, Marine Archaeology in India, Delhi, Publications Division (2001) ISBN 81-230-0785-X. A. S. Gaur, Sundaresh and Sila Tripati, “An ancient harbour at Dwarka: Study based on the recent underwater explorations”, Current Science, Indian Academy of Sciences (May 10, 2004). josyer ne vaimanik shastra ke bare main likhte samay apne hito ka dhyan rakha hai. it is an ancient text. please do not believe wikipedia. all that enetrs wiki is leftist and western indologist”s propoganda. Do your own reaserach. There are lot of resources. there is David frawley, Dr Rajaram, sanjeev Sanyal’s youtube and books, AJIT VAdakayil’s blogs and many others. on this aspect See youtube videos on history channel. Where can i find a pdf copy of Yantra Sarvasva, the complete volume? It is yet to be discovered as to where is yantra sarvasva? I was so passion about flying at my child hood my sister said that she saw a ancient vimana passing though clouds,I wonderd.. And i used to watch movies flying based.. Later i disided to become pilot gone through medical test went to Philippines that was my first flight i feel the controls but one thing i honestly saying it doesn’t sense me flying not a real joy according to me flying is not a rush in to air its flot naturally just like a bird…right now what we are flying is not a real aircraft its just for commercial…. Hi,friends….from the childhood i am bitter objectioner of tv serial “The mahabharata”.. becouse according to my grandmother’s mom, the story of ramayana and mahabharata is about 3,50,000years old the atomic war of kurukshtra. by her story she used to describe about arjuna( one of pandavas of mahabharata) destroy “hirramba nagari” returning timeto earth which situated between earth and swargolok. thats point of time indian space commanding officer is my only aim… but it is not possible to made a space city in 2014, but i will hopr so…weating for the day till the last breadth…. i m sachan and i want to collect our ancient text written by our maharishi. and i m worried about that western countries are working on our texts but we r not even what we have to look which is provided by western scientist, how we can get those articles in the original forms. I want to know if anyone is aware of how old this vimana shastra book is? sir can you please send me the copy of original copy of the “vaimanikha sastra” plss sir my contract no is 8790819893.
i am in search of karnkaustubh ,by its reference russia devloped first space launcher. I have a copy of Vaimanika shastra in pdf. Please post your email address and I will send it across from a broadcast email address. *** I am not sharing my email address just to avoid any controversy. or call me on 9971666560…. I would be grateful if somebody having English, Hindi or Sanskrit Version of Vaimanika Shashtra or anything relating to it, shares the same with me. You may please forward the same at arvindgoyalca@yahoo.co.in. I have been studying the relevant information for quite some time, and am very fascinated to study our ancient history and technology. See also for Rigveda-digbhashya-bhumika by Sh. Dayanand Saraswati…… It carries a chapter on Aerial Vehicles as described in Vaimanika Shastra. but recently i watch the movie hawaizaada and got curious about all.. I went to Smithsonian National Air and Space Museum Washington DC @ where first model of right brothers are available to display. Same gallery showed their mark-list as well when we asked museum guide why they need to put mark-list (?obviously as a evidence of their intelligence ) He said they were having just a cycle shop and not any other engineering background. So people of his own country questioned that how can he invent a plane?. When I dig more I came to know that his father was travelling outside of his country for many years. Exact evidence can be found if somebody willing to do so. This type of plane flying is a miracle rather than scintific venture. We can see a car leaping into air of excessive power is suddenly given. it is mentioned in resent research that vimanas mentioned in the vimanika sastra are impossible to fly and they breaks Newtons law of motion. in my perspective if the dont break the NLM they can not fly beyond our atmosphere…. Im very much interested to learn about our ancient vimanas… can anyone send me a copy of the book in english version pls..
We are still waiting to get the rights to upload the book online. As it is copy right protected, we would have to purchase the book from the publisher in Mysore or get it from Vedanta Book house in Chamarajpet, Bangalore. I was searching these text from years and found a PDF document which is copyrighted. And don’t know who is the author or creator of the document. The book is also with a famous library in Maharashtra, but they don’t allow to be copied or read. lot thanks for giving historical information………….. Feeling proud to know about our past, But i dont knw what to do next. kya is shastra dwara ham viman rachna ke sakte hin? guys, i have recently started research on vimana shashatra and i found one place on internet where i got some notes of real vimana shashatra. i found only six chapter with English translations with 10 Sanskrit pages too and also some file extensions for eBook too i have these three file extensions, but problem is that they are new to windows. i have stored them. no new path to vimana shashatra here. guys if you all are serious than we should start work on this. my whatsapp no. is 9165956362. u can contact to me and chat on whatsapp for further steps. so when we all going to meet…..???? would anyone provide me any information about its material and it’s any part which is related to it but is not on the site. I know very well that this project is confidential for its researchers. please……. Mr. Amit we are Indians and have more appropriate approach to the meaning of Sanskrit. So if we could get the code of PDF or if you have Sanskrit edition pls let me know. First i like to thank author for such fantastic information. Its happy to see light been throne on our precious shastras, it will defiantly show better path in future and bring glory to our country and to our assistors. I have seen this kind of work has been carried by foreign countries more than ours, its time to gather of like minded people to do extraordinary. I’m too interested in such kind of work so recently i started gathering information about ancient tech. I’m also interested to be part of your team and contribute. people here are laying more emphasis on vimanika shastra. but the fast is that the vimanika shastra book does not have much information on how to build the vimans completely. most of the method of purification of metals and alloy and the metallurgy process by which we can build the murcury vortex engine is provided in the vedas. for example, the vedas regard mercury with very importance. solidified mercury shiv linga is very powerful tool for worship. a liquid mercury alloy with ferrosoferic compound which is adhesive with mercury and can form a homogeneous mixture with mercury can be used in the vortex engine. spinning the mercury in a glass tube (as stated in vimanika shastra) using a series of electromagnets will cause a whirlpool or vortex and will negate/bend the gravitational fields. In adition the this, ever heard of acoustic levitation? Vimanika sastra also describes the use of asoustics which give sounds like So,Ma,Om, etc in the order 1,64,768 etc for levitation. My name is mahesh btech 4th year in EEE from hyderabad. Sir,I interested to invite a new vimana,sir I want to join in your project sir. There is a mention of other texts such as Darla shastra etc and mention of other properties of sun rays . Sir I wanted to ask if there are any remaining such texts other than vimanika shastra. Hello! I’ve been studying the Vimaniska skastra literature for more than a decade, and I’ve probably learned the secret of the mercury engine. It’s a device that generates a gravitational field! I am into drone designing field providing drones to Indian Army. let me know what want to join with my team to design based on above mentioned article. Atleast implementing the design part, i can assue it can be done. We an use battery as of now as energy generation method is bit complex. Please contact me separate at pranavah@vaimanika.com. We will have a better discussion if you are still interested on this. You may better contact Vedanta book house – in Bengaluru, to have the book or get the book from the printer in Mysuru. We have a soft copy, however, as it is yet to be out of copy rights, it has not been published online.